The ‘grow now, clean up later’ economic model that dominates our world and which does not account for climate change, pollution or the degradation of our natural capital is unsustainable. Europe needs to urgently step up efforts to transform its key systems of production and consumption towards sustainability. Compared to last year’s, this year’s scoreboard revised downwards the prospects of meeting three more objectives, important to the achievement of the 7th EAP priority objective that addresses sustainable, resource efficient low carbon growth. The outlooks for meeting the EU’s 2020 energy efficiency target and reducing the overall environmental impact of the housing sector by 2020 were revised from ‘likely’ to ‘uncertain'. Increases in the overall energy consumption and in the household sector were the main cause. The outlook for reducing the environmental impact of the mobility sector was also revised to ‘unlikely’ as greenhouse gas emissions from transport increased. (a) The examined past trend period is unique to each indicator and is specified in Annex 2.
assessment remains the same for the EU and the EEA member country (including the EU) indicator past trend. (!) The indicator has not been updated with more recent data in this year's report. Protect nature and strengthen ecological resilience: the outlook to 2020 remains bleak. 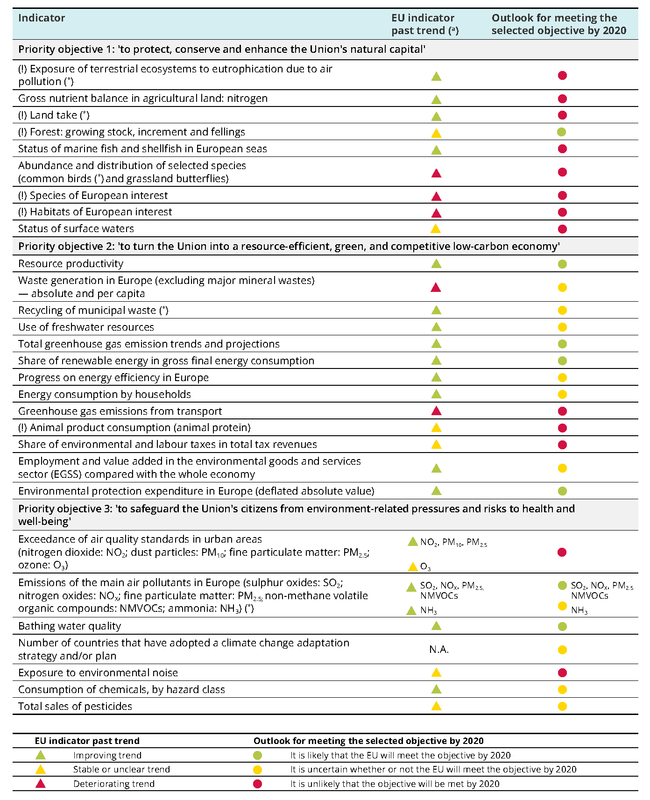 There continues to be a considerable negative impact on the EU’s natural capital, to the point that the EU is not on track to reach almost all of the selected 2020 objectives. For example, common birds – a key indicator for biodiversity – continue to show a declining trend and over-fishing continues to be a problem. Also there are still no policies in sight to promote the necessary reductions in the rate of land take (land lost to artificial surfaces such as buildings and roads). Boost sustainable, resource- efficient, low carbon growth: the outlook to 2020 remains mixed. The EU is on track to meet climate and renewable energy related targets for 2020, but it’s uncertain that the EU will meet its energy efficiency target. Waste generation has increased, while a reduction in environmental impact of production and consumption is uncertain for the housing sector and unlikely for the food and mobility sectors. Effectively address environment-related threats to health and well-being: the outlook to 2020 remains mixed. There have been substantial reductions in emissions of air and water pollutants in recent decades but key concerns persist around air quality and noise pollution in urban areas and ammonia emissions, which arise mainly from agricultural production and increased the past three years. Chronic exposure to chemicals is also a continuing concern. For references, please go to https://www.eea.europa.eu/highlights/achieving-eus-key-environmental-objectives or scan the QR code.